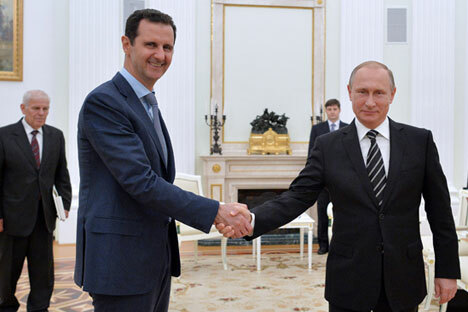 Syrian president thanks Russian leader for assistance in fight against ‘terrorists’. Syrian leader Bashar al-Assad made an unexpected visit to Russia on Oct. 20 to negotiate with Russian President Vladimir Putin, Kremlin press secretary Dmitry Peskov revealed on Oct. 21. "The negotiations were rather long and their topics were rather clear," he said, adding that Assad had thanked Putin for his assistance in the fight against terrorists in Syria. "First of all, I would like to express profound gratitude to the entire administration of the Russian Federation and the Russian people for the assistance they have been rendering to Syria. We are grateful for their backing of Syria's unity and independence. Most importantly, all this is being done within the framework of international laws," the Kremlin press service quoted al-Assad as saying. He once again thanked the Russian people "for the assistance they have been giving to our country" and expressed the hope that “we will be victorious in the fight against terrorism and will continue to act together for the restoration of the country from the economic point of view, the political point of view and the point of view of everyone's peaceful coexistence." "We are ready to make as considerable a contribution as we can not only in the course of combat actions against terrorism but also in the course of a political process," Putin said. Moscow is willing to do this "certainly in close contact with other world powers and with regional countries interested in the peaceful resolution of the conflict," he continued. He went on to state that Moscow would not tolerate a situation in which its citizens or citizens of former Soviet republics could appear in its territory after fighting for Islamic State in Syria – a scenario that frightens Russia, which has large Muslim populations in regions like Tatarstan and the Caucasus, as well as substantial migrant communities from Muslim former Soviet republics such as Uzbekistan and Tajikistan. "Unfortunately, people from the republics of the former Soviet Union are among those fighting in Syria with weapons in their hands against government forces, and there are at least 4,000 of them. And, certainly, we cannot allow them to appear in Russian territory after gaining combat experience and undergoing ideological indoctrination," Putin said. Like other countries, Russia is concerned about terrorist activities in the region, he said. "International terrorism's attempts to take significant territories in the Middle East under their control and destabilize the situation in the region are causing legitimate concerns in a lot of countries. This also concerns us, Russia," Putin said. "The Syrian people have offered resistance and have been combating international terrorism virtually on their own for several years, and while they have sustained considerable losses, they have also achieved considerable positive results in this fight of late," he said.